A bowl of leftover fish, in chunks.This was a rainbow from a friend. 4 cloves of garlic. We like garlic. Fried in palm kernal oil, maybe 10 minutes on one side, 5 on the other. The fish was already cooked so this was just to warm through and cook the egg that held it all together. 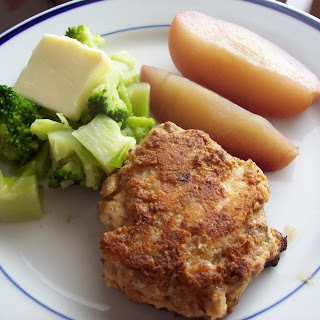 Served with cooked broccoli and cooked apples. Enjoyed by everyone! 0 Response to "Fish Patties"